There is never a dull moment around here. Then on Monday the house that’s going in down the road from us had its foundation poured, so a parade of cement trucks thundered up and down the road all day. Scout felt it her duty to bark at the passage of each one. Both ways. Jemma hid under the piano. It was traumatic for everyone. And now we are expecting rain in these parts so if anyone needs me I will be in my basement in the canoe. Harrowing tales of this nature just don’t come along every day! I’m dreadfully sorry if my horror stories have left you in a weakened state, but never fear! I have snacks! 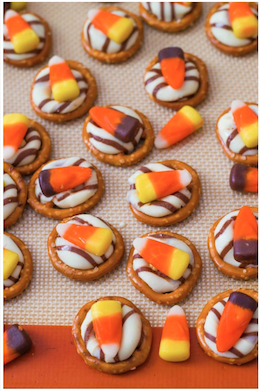 Candy Corn Pretzel Hugs 🙂 Recipe HERE! I think they might be easy enough for even me to make, so go ahead! Give them a try! Whether it is marker stains on the carpet or mud trails in the hall, Cleo blames her mischievous, imaginary friend, Pinkie, for everything. “Pinkie did it!” Soon Mommy can’t take it anymore and declares, “No more Pinkie!” But without Pinkie, the house is too quiet until Cleo makes another mess, this time, to everyone’s delight. This sounds really cute. I made a small tweak because I think if you put the Pinkie did it in the beginning it’s more of a hook. The only thing that didn’t quite work for me was the very ambiguous ending—Cleo made a mess to everyone’s delight? You don’t want to make readers guess, you want to intrigue them, yet this is just confusing. It would be better to be more specific so they can get the joke. Then they would appreciate it more. “Pinkie did it!” Whether it is marker stains on the carpet or mud trails in the hall, Cleo blames her mischievous, imaginary friend for everything. Soon Mommy can’t take it anymore and declares, “No more Pinkie!” But without Pinkie, the house is too quiet until Cleo makes another mess, this time, to everyone’s delight. It’s amazing what a difference a small change can make, isn’t it? As always, I find Erin’s comments so helpful! The Pitch: Miss Knaffle’s second graders have a thing or two to learn about their teacher. They think they can get away with feeding coffee beans to the class hamster, or making farting houses during read aloud. Will a trip to the zoo set them straight? When the canny Miss Knaffle enlists zoo animals to her cause, readers will delight in seeing what happens to children who don’t follow the zoo rules in this PB cross between Peggy Rathmann’s GOODNIGHT, GORILLA, and William Bee’s WHATEVER. Please send YOUR pitches for the coming weeks! For rules and where to submit, click on this link Would You Read It or on the Would You Read It tab in the bar above. There are openings in December so you’ve got a little time to polish up your pitches and send yours for your chance to be read by editor Erin Molta!